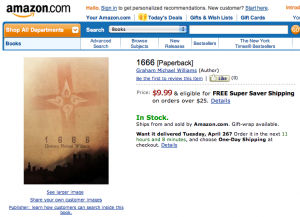 APPROVED: 1666! The first arrivals! 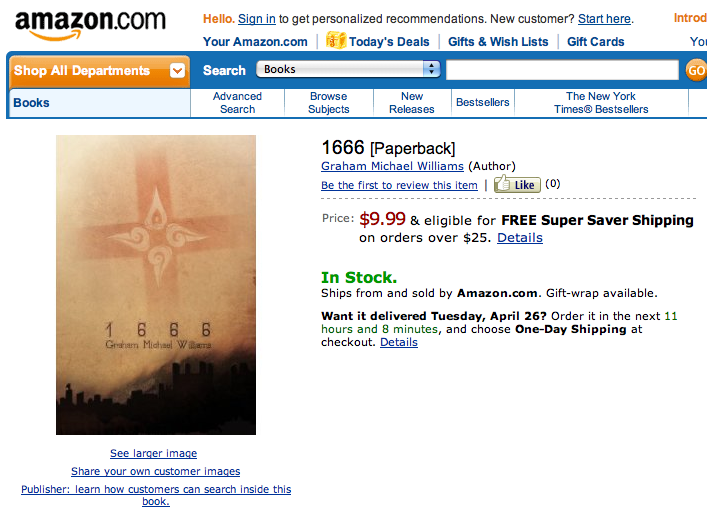 1666 is now available for sale through CreateSpace and Amazon.com. Both outlets are offering the book for $9.99 for the paperback copy. The book is 6″x9″, printed on cream paper, and features a gorgeous full-colour cover with art by Vancouver designer Jeff Sobol. An ebook version will be available shortly. If you’re in the Vancouver area I have copies available for sale in person, no shipping required. The book is $10 in person, and includes a free signature and personalization. I’m thrilled to see my first novel become a reality, and if you do purchase a copy I hope you enjoy reading it as much as I enjoyed writing it.